In a previous post, ‘Starting in the margins’, I noted that early examples of English writing were typically not standalone texts; rather, they tended to be glosses to Latin texts. In such bilingual documents from early medieval England, the Latin text was given prominence visually – the script was larger and it filled the main text block – while the English gloss, squeezed in between the lines in a smaller script or placed in the margins, was clearly meant to be apparatus in a supporting role. British Library MS Cotton Nero D.iv (Lindisfarne Gospels), fol. 45r. Although this relationship of Latin and English continued to be expressed in similar ways in documents throughout the Middle Ages, there are also many cases in which the two languages appear to switch positions: English as the main text, Latin in the margins. 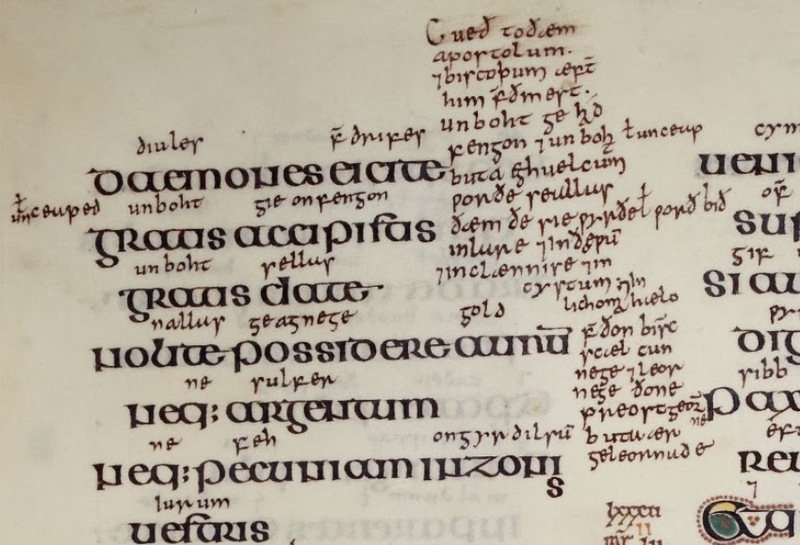 The image above shows part of a late 10th-century manuscript: Cambridge, Corpus Christi College MS 12. It is a copy of the late 9th-century Old English translation of the (originally Latin) Cura pastoralis of Pope Gregory the Great. This English translation was, as its famous preface explains, the result of a crisis in learning in England: after the Viking incursions of the previous century, literacy had declined so that very few, even priests, could read and write Latin. Consequently, King Alfred’s educational reforms implemented literacy training in English, so that those who needed to read could learn to do so in the vernacular as an intermediate step to Latin literacy. An English translation of this important medieval handbook for pastoral ministry would make it accessible to those clerics who could read English but were not proficient in Latin. Added to the Old English text in this manuscript are a number of glosses in a few different hands. The glosses by one of these annotators are particularly recognisable: he is a 13th-century glossator known to modern scholars as ‘the Tremulous Hand of Worcester’, because we don’t know his name but can recognise his distinctive left-sloping, wobbly handwriting in a number of books from Worcester Priory. On this page, the Tremulous Hand has written his glosses in Latin. For example, the first annotation in the right margin identifies the biblical quotation in the main text as a passage from Matthew 23: ‘they seek to be greeted first and honoured in marketplaces and in feasts, and to be the first to recline at suppers, and they seek the most important seat in meetings’ (loosely translated from Latin amant autem primos recubitus in cenis, et primas cathedras in synagogis, et salutationes in foro). About halfway down the page, the Old English word medomlice ‘properly’ is glossed by Latin digne. Thus the positions of the two languages have been reversed again: in the 13th century, the Old English text was so difficult for a Middle English speaker to read that he glossed it in Latin. By the end of the Middle Ages, it was common for English to be the language of the primary text and Latin to take the supporting role as the language of annotation. Above, for example, is a late 15th-century copy of the poetry of Chaucer (Rylands Medieval Collection, English MS 113), and this page shows part of the Man of Law’s Tale from the Canterbury Tales. The female protagonist, Custance, is leaving her home to be married against her will, and the narrator bursts into a lament against astrologically determined fate: ‘O furst movyng, cruel firmament.’ In the left margin is a Latin gloss, learnedly supplying the source of this passage: Ptolemy’s Almagest, book 1, chapter 8, which explains how the motions of astronomical objects are caused by the revolutions of the heavenly spheres. These Latin glosses in the Man of Law’s Tale appear in the earliest manuscripts of the Canterbury Tales and continued to be copied by later scribes, as in this case. It’s easy to see in these examples a story of two languages switching places. In the early Middle Ages, Latin was the primary language in English manuscripts and English appeared, if at all, as the language of glosses. 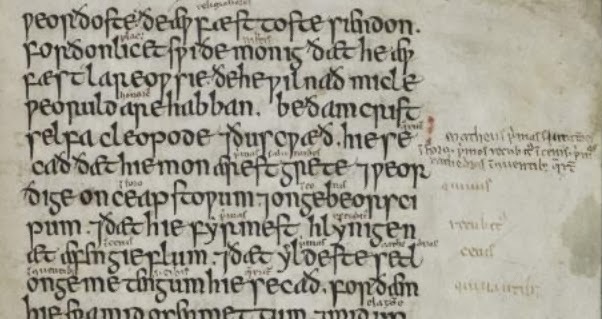 In the late Anglo-Saxon period (c 900 onwards), English became a language of record in its own right; by the 13th century, we have manuscripts in which an English primary text is being glossed in Latin. In textbooks about the history of the English language, these developments are often described in rather triumphalist terms as ‘the rise of English’ (over Latin and later over French as well). But the story is more complicated than that. It is clear from the Chaucer manuscript, for example, that, unlike modern editors, the scribe considered the Latin annotation to be part of the text, and accordingly copied it alongside the English lines. And in both the Tremulous Hand’s glosses and in the Chaucer manuscript, the Latin annotations attest that the English text is based on reputable sources: the Bible in the first case and classical astronomy in the second. In other words, Latin continued to be the language of authority. Its presence in the margins of English texts in the later Middle Ages was not a demotion, but a testimony to its persistent influence. The most comprehensive study of the Tremulous Hand is Christine Frantzen, The Tremulous Hand of Worcester: A Study of Old English in the Thirteenth Century (Oxford: Clarendon P, 1991). Many thanks to University of Saskatchewan student Danielle Grant for drawing my attention to Rylands Medieval Library, English MS 113. On the glosses to the Man of Law’s Tale, see the Explanatory Notes to the Tale in Larry D. Benson, ed., The Riverside Chaucer (Boston: Houghton Mifflin, 1987) 856-859.